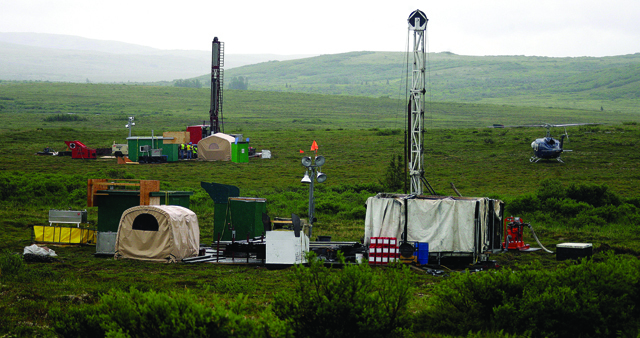 The company spearheading the Pebble mine is again long on mineral prospects but short on cash after another major potential funder turned away from the project, according to a release from Northern Dynasty Minerals Ltd.
Vancouver-based Northern Dynasty Minerals, the sole parent company to Pebble Limited Partnership, issued a statement early May 25 acknowledging that its framework investment agreement with First Quantum Minerals has been terminated. In December, the two Canadian mining firms announced they had reached an option agreement under which First Quantum made an initial $37.5 million payment to Northern Dynasty with plans to make three more similar payments totaling $150 million over four years. At the end of that period First Quantum would’ve had the option to buy a 50 percent stake in Pebble Limited Partnership for $1.35 billion. First Quantum operates six primarily copper, gold and zinc mines worldwide. The pre-development Pebble prospect is Northern Dynasty’s sole project. The initial $150 million was intended to fund the permitting process for Pebble, while the subsequent major investment would have helped develop the mine and its extensive support infrastructure. First Quantum was originally supposed to decide whether or not it would invest in Pebble beyond the $37.5 million payment by April 6, according to the framework agreement. The companies first pushed that deadline back to April 30 and later to May 31. Groups opposing Pebble quickly began pressuring funds with investments in First Quantum to divest their interests in the company if it were to get involved in the Pebble project long-term. Those same groups were able to spend Memorial Day weekend celebrating Northern Dynasty’s announcement. Pebble Partnership leaders have long acknowledged they need to secure another major investor partner before the mine can be built, so what the revelation means for the future of Pebble and Northern Dynasty is unclear. Pebble CEO Tom Collier downplayed the significance of failing to reach an agreement with First Quantum in a formal statement following the Northern Dynasty announcement. Collier said he is continuing on with “business as usual” because he is confident the junior mining company will secure the funding it needs to complete the project’s environmental impact statement. “Pebble remains one of the nation’s most important undeveloped mineral resources. It is on state land and is an important economic asset for Alaska,” he said. A spokesperson for First Quantum could not be reached for comment. Northern Dynasty held $27.9 million Canadian, or roughly $21 million U.S., in cash on March 31, according to its first quarter financial report issued May 15. At the same time, it had also accrued $13.5 million Canadian in near-term liabilities and total liabilities of $68.7 million Canadian. Northern Dynasty stock closed trading May 25 on domestic markets at 47 cents per share, down 33 percent from its prior closing price of 70 cents per share. The company is also traded on the Toronto Stock Exchange. London-based mining major Anglo American withdrew from Pebble in 2013 after spending more than $540 million exploring the copper and gold deposit. In 2014, fellow British mining firm Rio Tinto donated its 19 percent ownership in Northern Dynasty to the Alaska Community Foundation and the Bristol Bay Native Corp. Education Foundation. Bristol Bay Native Corp. has helped lead the fight against Pebble. BBNC President Jason Metrokin said First Quantum “ultimately came to the right conclusion about the Pebble project”. In early April, a group of 50 conservation and outdoor recreation companies and organizations sent a joint letter to First Quantum leaders imploring them to stay out of the Pebble project. Further, a group of Alaska Native leaders from the Bristol Bay-area traveled to First Quantum’s May 3 shareholder meeting in Toronto to deliver a similar message. California Treasurer John Chiang, a trustee to the state’s $360 billion-plus Public Employees’ and Teachers’ Retirement systems, sent a letter to First Quantum leaders Jan. 29 urging them to stay out of the Pebble project because CalPERS officials believe sustainable business practices are fundamental to long-term value growth for shareholders. According to Chiang, the Pebble project would risk the sustainability of fisheries in the Bristol Bay region as well as the fund’s investment in First Quantum. At the time, CalPERS held 4.3 million shares of First Quantum amounting to 0.62 percent of outstanding stock in the company as well as bonds in First Quantum with a maturity value of $2.3 million. Additionally, Environmental Protection Agency Administrator Scott Pruitt, generally seen as a bane to conservation advocates, issued a surprising statement Jan. 26 expressing his “serious concerns” about the impacts of mining activity in the Bristol Bay watershed. As a result, Pruitt said the EPA would not finalize its proposed withdrawal of the 2014 proposed determination to prohibit a large mine in the Bristol Bay region through its Clean Water Act Section 404(c) authority. Pruitt stressed that his decision would not impact Pebble’s environmental review under the National Environmental Policy Act, or NEPA, but it kept a cloud of uncertainty over the project that Pruitt was expected to remove. Pebble Limited Partnership filed its wetlands fill permit application with the U.S. Army Corps of Engineers Dec. 22. The initial application outlined plans to fill 3,190 acres of wetlands at the mine site. While not specific to any mine plan — a point Pebble and parent company Northern Dynasty minerals have stressed — the Bristol Bay Watershed assessment published by EPA in 2014 concluded a mine that would fill more than about 1,100 acres would be too damaging to fish habitat to allow.